After stopping as required by paragraph 1 or 2 or this subsection, the driver of a motorcycle or bicycle, facing a steady red signal which fails to change to a green signal within a reasonable period of time because of a signal malfunction or because the signal has failed to detect the arrival of the motorcycle or bicycle due to the vehicle's size or weight, shall have the right to proceed subject to the rules applicable after making a stop at a stop sign as required by Section 11-1204 of this Code. The new law will apply only to municipalities with less than 2 million inhabitants, obviously exempting Chicago. The house bill seems to have been initially proposed due to a perceived problem for motorcyclists who sometimes find themselves, especially in less populated parts of the state, sitting at traffic signals for inordinate periods of time with nary a car or truck in sight. Apparently, a motorcycle may not be large or heavy enough to trip the sensors that facilitate light change. Bicyclists were later added to the bill. Despite the late addition of bicyclists to this legislation -- and its exemption in Chicago -- this law should be viewed as progress for Illinois cyclists. Our traffic laws do not reasonably reflect the realities of how bicyclists use our roadways. Bicyclists should not simply blow through red lights and stop signs without looking. At the same time we should not be required to lumber about like a two ton motor vehicle. It would be reasonable, in my opinion, for bicyclists throughout the state to be permitted to treat traffic signs and signals as yield signs. That is how most people ride anyway. If the coast is clear, after slowing to a stop or near stop, bicyclists should be permitted to proceed. This is not the law. But the new provision to be signed by Governor Quinn is a step in that sensible direction. Here is some video from Univision of the Ghost Bike Ceremony held on Saturday in honor of Dion Harris who was struck and killed by a motorist on May 8th. A Ghost Bike ceremony will be held tomorrow morning in honor of a sixteen year old boy who was killed by a motor vehicle as he road his bicycle on May 8th. A permanent Ghost Bike will be installed near the intersection of West Grand Avenue and Kolmar Avenue by friends of Dion Harris at 10:00 a.m. So far, 69 people have agreed to participate, according to a Facebook page set up to promote the event. All are invited. Yesterday, a few hundred riders across Illinois braved lousy weather and the siren song of Bulls playoff basketball to join many others from around the world in commemorating bicyclists killed and injured by motor vehicles. The Ride of Silence occurs worldwide each year. This time the ride included 126 riders in Chicago, 136 in Peoria, 58 in Joliet and 68 in Arlington Heights who solemnly cycled past several Ghost Bikes set up as memorials marking the sites of bicycle crashes. Here is a link to photos from the Chicago ride. A Chicago bicycle commuter will be compensated for injuries he received when an SUV pulled in front of him as he rode in the bike lane along Milwaukee Avenue, near the intersection with Ogden Avenue, in August. A settlement agreement was reached yesterday between the bicyclist, whom we represent, and the driver. The cyclist sustained a facial laceration and a neck injury when the vehicle abruptly pulled out of a drug store parking lot and into the dedicated bike lane. The bicyclist immediately grabbed for his brakes but could not avoid cashing into the side of the SUV. The incident occurred at around 7:30 p.m. The cyclist was riding home from his office in the Loop. Chicago's new mayor-elect has released his 2011 Transition Plan which contains some significant benefits for city bicyclists. Rahm Emanuel's plan proposes the creation of 25 miles of protected bike lanes yearly for use by persons of all ages and abilities beginning in his first year in office. A two mile long pilot location for a protected lane is to be chosen within his first 100 days in office. Protected bike lanes will be located between the sidewalk and parked cars which would shield cyclists from moving motor vehicle traffic. The City will prioritize creation of these new lanes to link various neighborhoods to Downtown and to each other. (See Initiative #25 on page 37). The bicycle will be taken seriously as a mode of intracity transportation when it becomes reasonably safe and convenient of everyone. 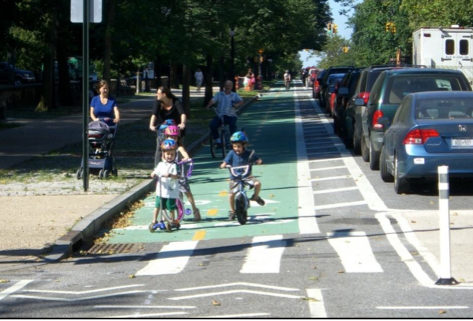 Protected bike lanes mean that shuttling young children to school or daycare in a trailer, bakfiet or child seat becomes a viable option for more people. Take the fear of getting poleaxed by a car out the the equation and more Chicagoans will perform more errands on their bikes, reducing the number of cars on city streets. This will reduce congestion for drivers and cyclists alike, lessen carbon emissions and make streets safer for all. Sixteen year old Dion Harris of the 1600 block of North Kolmar Avenue was killed last night when he and a motor vehicle collided as he rode his bicycle near the intersection of West Grand Avenue and Kolmar Avenue in Chicago, according to the Chicago Breaking News Center. Chicago Police apparently report that the boy ran a stop sign, causing the crash. However, few facts have been reported. The News Center states that, "The youth was taken in very serious condition to the hospital where he was pronounced dead." No witnesses are identified. Presumably, the only version of events was that of the driver. Also, the News Center reports that the boy "was riding his bike in the 4500 block of West Grand Avenue when he disobeyed a stop sign at Kolmar Avenue and ran into the middle of traffic." It adds that, "The teen struck a vehicle driving on Grand near Kolmar. There are no stop signs or traffic lights at that intersection in the direction the vehicle was traveling." This report makes it sound like both Harris and the driver where traveling on West Grand Avenue at the time of the crash. However, the story also gives the overall impression that the bicyclist and the driver approached the intersection perpendicular to one another. At the intersection, Kolmar Avenue is controlled by a stop sign. No sign controls traffic traveling on West Grand. Harris' died about one block from his home. Hopefully, additional facts will be brought to light in the coming hours and days. Are Some Shimano Dura Ace 7800 Cranksets Prone To Break? What's up with Shimano Dura Ace 7800 cranksets? I've recently heard stories from two attorneys in different parts of the country that these expensive "hollowtech" cranks may be prone to crank arm failure. I wish to emphasize that to the best of my knowledge there has been no product recall announced, nor am I aware of an serious injury being linked to crank arm failure. Still. In one incident, a bicyclist was pedaling uphill when his Shimano Dura Ace 7800 crank arm "suddenly snapped, throwing him to the ground." 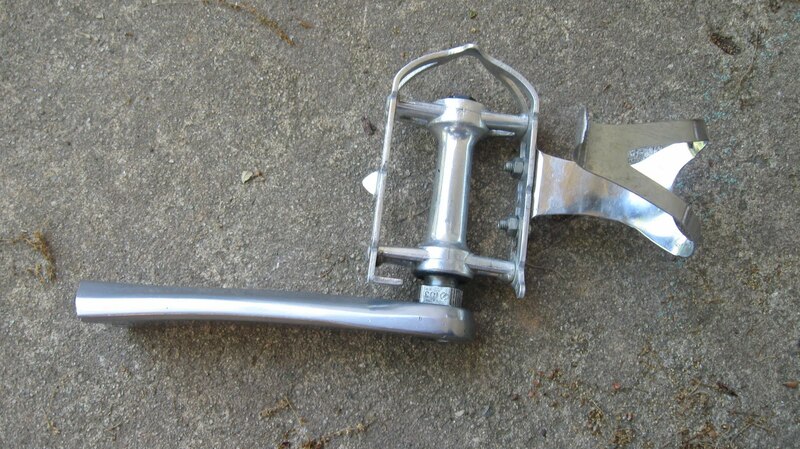 In another incident a cycling physician saw his crank brake while riding with it after only three years of use. Fracture of a crank arm while under stress could certainly result in serious injury. A brief search for more information online uncovered other anecdotes of crank failure. However, it is not at all clear how widespread this problem is.